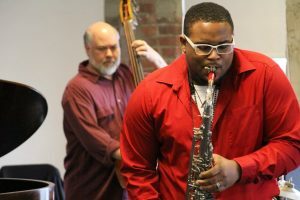 Columbus, OH –The Jazz Arts Group of Columbus (JAG) has announced its winner of the 2017 Hank Marr High School Jazz Award – 17 year-old saxophonist, Craig Jackson, a graduate of Stivers School for the Arts in Dayton, Ohio. The award demonstrates excellence in musicianship and performance amongst Ohio’s young students of jazz and comes with a cash prize of $500 and an opportunity to perform with the Columbus Jazz Orchestra, led by Byron Stripling, on the August 4th, 2017 JazZoo concert at the Columbus Zoo and Aquarium. Jackson was one of three young performers to make it to the finals of the competition which began with a first round blind audition process adjudicated by Ryan Hamilton, professional trombonist and instructor at Capital University; Ben Huntoon, trumpeter and Jazz Education Specialist at Stanton’s Sheet Music; and Jim Leslie, drummer and Artist in Residence at the University of Dayton. A former member of the Cincinnati Youth Orchestra, Jackson plans to attend Berklee College of Music in the fall of 2017. Students in the first round represented Cincinnati, Cleveland and Columbus and Dayton, OH. The other finalists were Samuel Breadon, guitarist, a junior at Walnut Hills High School in Cincinnati; and Lucas Stickley-Miner, trumpet, a graduate of Centennial High School in Columbus and an alumnus of the Columbus Youth Jazz Orchestra. Adjudicators for the final round of the competition were Tom Carroll, guitar, retired Professor of Music, Denison University; Jim Rupp, drums, Lecturer, Ohio State University; and Shawn Wallace, saxophone, Associate Professor and Area Head of Jazz Studies, Ohio State University. Columbus music legend Hank Marr was one of the world’s masters of the Hammond B-3 organ. Along with Hank’s celebrity status as a member of the jazz elite, he was a dedicated and gifted educator. In recognition of over fifty years as a performer, teacher, arranger and conductor, the Jazz Arts Group established the Hank Marr High School Jazz Award as a tribute to this special individual. His willingness to “pass it on” makes the encouragement of young jazz artists an important and meaningful activity. The Jazz Arts Group of Columbus (JAG) is America’s oldest not-for-profit arts organization dedicated to producing, performing and promoting jazz. JAG is the third largest performing arts organization in Columbus and consists of four focus areas: the Columbus Jazz Orchestra (CJO), one of the world’s finest professional jazz orchestras; the Jazz Academy, JAG’s extensive instructional programs educating both students and adults about jazz and American music; Inside Track, a jazz and blues performance series produced at the historic Lincoln Theatre; and Affiliate Musicians, a program providing employment opportunities for professional musicians.